BOZEMAN, MT--(Marketwired - January 11, 2015) - Jefferson Bus Lines announced today that its Bozeman bus depot will relocate to the Flying J Travel Plaza at 6505 Jackrabbit Lane, Belgrade, MT 59714, as of January 11, 2015. "We are excited about the move and our partnership with the Flying J. Although the new location is in Belgrade, it is within minutes of the current Bozeman depot, allowing us to continue to serve residents in that area," said Kevin Pursey, Director of Marketing for Jefferson Lines. The Flying J Travel Plaza remains ideally located off of I-90 with easy access on and off the freeway for customers. The new location will continue to provide the same services currently offered, which include ticketing, bus drop off and pick up, and package express. However, it will also offer new customer conveniences such as an on-site restaurant, convenience store, and fuel. "We feel strongly that this move better supports our goals to provide exceptional customer care and service," said Bob Musil, Business Development Manager of Jefferson Lines. Musil went on to say that while the physical location of the Bozeman depot is changing, all route schedules and contact information will remain the same. To contact the new Belgrade bus depot directly, please call 406-587-3110. For detailed schedule and fare information about Jefferson's routes, visit www.jeffersonlines.com or call toll free 800-451-5333. 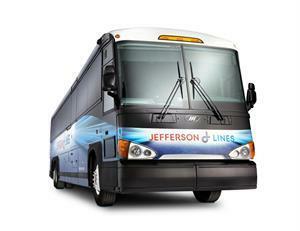 Follow Jefferson Lines online at facebook.com/JeffersonBusLines or on Twitter @JLBUS. About Jefferson Lines: Founded in 1919, Jefferson Lines provides cross-state transportation throughout central United States. Our area of service expands over 13 states from Wisconsin to Montana and Minnesota to Texas, serving over 160 communities nationwide. Jefferson Lines provides direct connections to thousands of destinations in the U.S., Canada, and Mexico.